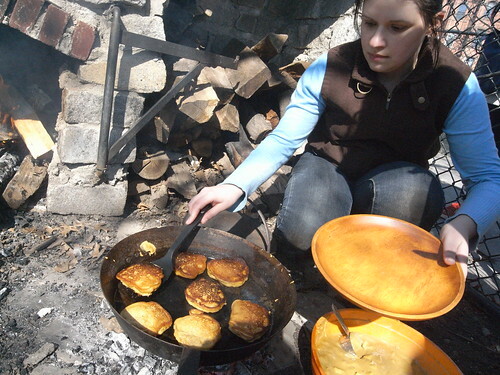 Cooking Apple, Sour Milk & Molasses Pancakes at Old Stone House yesterday. See more photos from the event here. 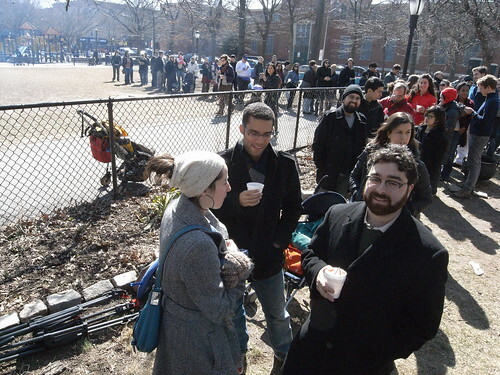 Despite a constant flow of pancakes, the line was this long for an hour and a half. I was flabberghasted. I want to thank everyone who was able to make it out yesterday, and thank you for waiting patiently and amicably while I furiously flipped flapjakes. I simply was not prepared, nor was I expecting, to serve hearth-cooked pancakes for 200 people; I’m so pleased that everyone was able to get a taste, and (hopefully) went home happy. If you enjoyed yourself, then I encourage you to make these recipes at home! They work just as well on an electric skillet as they do over an open hearth–and it’s probably a more efficient method of cooking. Thank you again for the wonderful day; if you were able to attend, please leave your thoughts in the comments. Enjoy the recipes, and I sincerely hope to see you at another event in the future. Adapted from The New England Economical Housekeeper by Esther Allen Howland, 1845. Modern recipe adapted from The Old Sturbridge Village Cookbook, 3rd ed. by Jack Larkin, 2009. The original recipes instructs the cook to deep fry these pancakes in lard, like a doughnut. But I find this recipe works just as well fried with butter on a griddle or in a skillet. 1. Combine milk and molasses, whisking until emulsified. 2. Pare and core apples, and dice into 1/4 in. cubes. Add to milk and molasses mixture and set aside. 3. In another bowl, whisk cornmeal, baking soda and flour until combined. Using a wooden spoon or a spatula, create a well in the center of the dry ingredients. Pour milk mixture into the well, and mix until combined. 4. Fry in a skillet or on a griddle, with a generous amount of butter. Serve with maple syrup, butter, or a hard sauce. Rosewater can be food in the Indian or Middle Eastern section of your grocery store. 1. Combine sugar, cloves, baking soda, flour and salt in a large bowl. Whisk until combined; set aside. 2. Whisk the milk into the egg and rosewater mixture. 3. Using a wooden spoon or a spatula, create a well in the center of the dry ingredients. Pour milk mixture into the well, and mix until combined. 4. Fry in a skillet or on a griddle, using a generous amount of butter. Serve with maple syrup, butter, or a hard sauce. Adapted from Food, Drink and Celebrations of the Hudson Valley Dutch by Peter G. Rose, 2009. 1. In a large bowl, whisk together flour, cornmeal, sugar, and spices. Set aside. 2. Whisk together egg and milk mixture with pumpkin puree until throughly amalgamated. From Miss Corson’s Practical American Cookery and Household Management by Juliet Corson, 1886. Beat in an electric mixer on medium until evenly combined. We had the clove and rosewater pancakes, and they were amazing! Thank you for posting these recipes–we’ll definitely try them at home. Thanks for posting these recipes! I’m glad your event was such a success although regrettably I wasn’t there – I was still sleeping, lazy me! But I will share your recipes with the steampunk communities and maybe some people will be inspired to try them! hey, thanks everyone!! It’s so good to know that the food was tasty, and thanks for the links and photos! And rachel–I love the idea of a steampunk jammie/lingerie breakfast. We should make that happen. Thanks Sarah for sharing your wonderful recipes! I read about your event through the Brooklyn Based weekly email. Just had a baby, so I thought…. I need a day out of the house and free pancakes sounded enticing! The weather couldn’t have been better for early March. We had the pumpkin cornmeal pancakes and really enjoyed topping with the hard sauce and a bit of maple syrup! Yummy, what a treat. Thanks again for sharing.